As the pensioner counted out her coins and asked me how much meat she could afford, I got a sinking feeling. I felt a pang of guilt as I weighed her breaded ham, knowing that according to the supermarket's own policy I should have thrown this in the bin. Like millions of others, the old woman came to the supermarket every week for her grocery shop. The benefits are obvious. They are open all hours, offer free parking, have a huge selection and, most importantly, they can be a lot cheaper than the High Street. This is what attracts 16 million customers to Sainsbury's and 20 million to Tesco every week. Last year I was contacted by several supermarket employees working up and down the country. They told me they had serious concerns about the food they were being asked to sell. One whistleblower in particular, from Didcot, was worried about the things she had seen. So I applied for positions at a Sainsbury's in Didcot, Oxford, and later Tesco in Woodford Green, North London. I used fake references, which none of the stores checked before I started work. After working undercover at both stores for a total of four months, I discovered that customers were often deceived about the freshness and quality of the food they were buying. At times, even customers' health may have been put at risk. I saw first-hand that cheap food can come at price. What I discovered during my six month investigation into Britain's supermarkets for BBC One's latest Whistleblower documentary will change the way I shop forever. The food we buy has a shelf life. It should be disposed of on a particular date to ensure its freshness and quality is maintained. From the outset, I discovered this dating system could easily be changed by staff who would wipe out existing dates and write in other, later dates. It is not illegal to sell food past its sell-by date, but it is store policy at both Sainsbury's and Tesco that once the food has passed that date it should not be sold to customers. Yet, I saw food past its sell-by date on the fresh food counters at both supermarkets, and it was regularly being sold. At Tesco, it was re-packaged and re-labelled with a new date and reduced in price, sometimes days after it should have been sold or removed from the shelves. 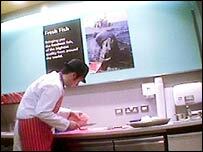 A lot of the time, the counter staff treated the meat and fish we were selling with indifference and, worryingly, there were times at Tesco when they had no idea what the real sell-by date was as they had altered it so many times. Sometimes it was not until the food smelled bad that it was eventually thrown away. The counter manager at Sainsbury's regularly asked me to extend the dates on deli items because they smelt "OK". She offered reassurance by saying that she often had food past its sell-by date hanging about in her fridge at home. But the point was, the customers had no idea the food we were selling was not fresh. And to me, smelling food is not a very scientific or foolproof way of assessing its shelf-life and it is no surprise that I did not find it mentioned in the health and safety guidelines. Staff were told to use their common sense about extending the shelf-life of food. Unfortunately, not everyone I worked with displayed much common sense and some who applied this approach were just plain irresponsible. An ex-supermarket manager told me that food was sometimes "tarted up". He was not surprised by what I had seen. "If you want to make food look fresher, you can mix batches," he said. "If you take four or five slices of something from one day, you can mix it in with four, five slices of something from the next day. Rehydrating it, that kind of thing." Supermarkets are known for being ruthless when it comes to profits. It is a business after all and they are competing for a slice of an industry estimated to be worth £66bn a year. But I never expected to witness the level of penny-pinching that drove one employee I worked with at Sainsbury's to cut the end of a brown and drying ham joint so it looked fresher and could be put back on display... to put more pennies in the company's coffers. My boss on the meat counter at Tesco instructed me to use a bin-bag style cover to put over the meat at night, which would have been fine, except he was so intent on saving money that he insisted I use the same one night after night - marked with blood from the food - rather than getting fresh ones. And all for the sake of saving tiny sums. During my induction at Sainsbury's, the trainer instructed us to "treat every penny as though it were your own". That sounded fair enough. Nobody wants to waste food unnecessarily. However, over the course of my investigation I witnessed individuals taking this motto far too literally. Managers seemed under pressure to extend the shelf-life of food in order to keep their weekly "wastage budgets" to a minimum and thereby help keep store profits high. They would come out of the weekly "team huddle" - which I saw at both the Sainsbury's and Tesco stores - buzzing and hungry to hit targets. Even as a counter assistant, the pressure other staff seemed to feel was almost tangible. But this appeared to lead some staff at Tesco to run real risks with customers' health. The use-by date on labelled food is the point beyond which it is illegal for that food to be sold. Yet when I worked on the meat counter at Tesco, I saw use-by dates changed and ignored. The counter manager at Tesco told me he had little training on the food counters and had few staff, yet he was responsible for overseeing three counters: meat, fish and hot chicken. One day, he extended the use-by date on a batch of lamb by six days. That is against the law. When I asked him why he had done it, he simply said: "Tesco's is going to judge me by how much money I am able to make. "I can't afford to throw anything away." In a bizarre attempt to explain his dates-changes, he used the company's commitment to green issues by saying "Tesco doesn't like to throw away anything. That's why we recycle. That meat can be recycled". But I'm not sure a commitment to a green policy quite extends to the unlawful selling of meat. I think it was the deception of customers, and a sometimes a blatant disregard for their health, that surprised me the most. 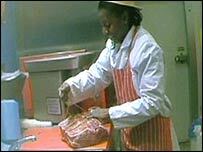 One day at Tesco, I noticed the mincer on the meat counter was smelling bad. It seemed that a fault in the mechanism was heating up the mince. I removed several pieces of meat that were cooked but instead of throwing the meat away, the raw and partly cooked mince was simply mixed together and put back onto the counter. This was most certainly a risk to customers' health. Ensuring that food was maintained at a safe temperature was an alarmingly low priority amongst some staff, I discovered. On one occasion at Sainsbury's, I found a lonely looking box of brawn, a cured ham in jelly, on the floor and was worried there was a risk that it could have become warm and bacteria could have developed and spread. Two of my colleagues joked that if this was the case it would be a good thing as it'd "kill the old ladies off more quickly - they love the stuff". At both Sainsbury's and Tesco, I was told about "the cold chain". This is the rule that says any food that should be kept in the fridge or freezer mustn't be left out for more than 30 minutes. Otherwise there can be serious consequences, as bacteria build up and can cause food poisoning. One manager at Tesco put it to me this way: "once food has developed bacteria, it's like getting Aids; once you've got it, then it spreads and you're dead". This might have been an exaggeration but I wasn't left in any doubt about the importance of food temperatures. When chilled and frozen food is transported from one temperature-controlled area to another - for instance, between the delivery lorries and the store shelves - it should not be in transit for more than 30 minutes. At Sainsbury's, I found that boxes would sometimes go astray and often we could not unpack deliveries quickly enough for them to be chilled in time. One day, a delivery sat around for three hours as there was no time to put it out on the counter and no more room in the fridges. When I pointed out the problem, I was told to shut up and stop making a fuss - especially at Christmas-time when the priority was to serve customers. 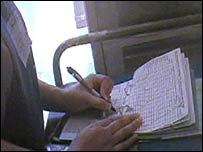 Supermarket staff are required by law to carry out temperature checks on the fridges storing food. These records are incredibly important because they can be called upon as evidence if, for example, a customer takes a supermarket to court claiming they got food poisoning from something purchased at the store. Yet I regularly saw fridge temperatures being faked by staff. One even showed me how to do it and whose signature was easiest to fake. She told me the figures to put in, adding "put in a high one sometimes" - presumably to make it look more authentic. Anti bacteria solution is used to wipe down items such as the counter surfaces, knives, trays, meat slicer etc. and should be changed every 30 minutes. Meat was sometimes "tarted up"
But I saw dirty buckets of the stuff sitting for hours on end collecting more and more food debris and grease. From the pristine supermarket uniforms that lull us into a false belief that hygienic practices are being implemented, it is very different behind the scenes. When I confronted a more senior member of staff I was simply told that it was unrealistic for everyone to "do their job properly". At Tesco's I was, at times, left unsupervised to work across both the meat and fish counters, even though their official guidelines states that trainees should not be left alone for any amount of time. Following my initial induction, which consisted of nothing more than a general health and safety chat, I managed to muddle my way through until I was eventually given something called Bronze Training. Now, Tesco are proud of their training, but when I was tested I was simply handed the answers I needed and told to input them on a separate sheet. By this point I'd seen enough. In the four months I'd been working behind supermarket counters I'd begun to feel guilty about selling that brawn to the sweet old ladies who came in daily to ask my advice on recipes and have a bit of a chat. Based on what I saw and filmed, I believe that many of the counter staff at these supermarket stores had become used to changing dates on food. And senior managers at Tesco and Sainsbury's had failed to put a stop to it. When I worked there, the concept of fresh food was often not what you and I would expect. Food items on the counter were treated as mere "product" in need of shifting. My healthy appetite for supermarket shopping diminished; I felt sick and lost more than a stone in weight after seeing how my food was treated. After the investigation was over I informed both Sainsbury's and Tesco of my experience. Sainsbury's said they take any matter relating to food safety extremely seriously and told me they had launched an immediate investigation at the store. As a result, they said they have identified some instances where their procedures had not been followed correctly at that store and that they have taken the necessary action to ensure these matters are addressed. Any local breakdown in procedure is entirely unrepresentative of the hard work and commitment to the high standards displayed every day by Sainsbury's store colleagues, the supermarket insists. Based on the information provided in advance by the BBC to Sainsbury's, the supermarket was, however, unable to see that food safety was in any way compromised. When I told Tesco about the documentary they said the programme paints a deeply false picture of its business. "With the little detail we have, we looked vigorously at the store and our suppliers and we are satisfied that any incidents captured on film were not representative of the high standards we insist on," Tesco said. "That said, we take allegations of this nature very seriously and, as a precaution, have retrained all counter-staff in this store," it added. "Our customers should not be fooled into thinking that this programme has uncovered systematic failures or that the public is at risk. "Customers trust us to provide them with safe food of the highest quality and we would never do anything to jeopardize that trust." Whistleblower: Supermarkets was broadcast on Tuesday 22 May on BBC One and is available online for seven days from this page.